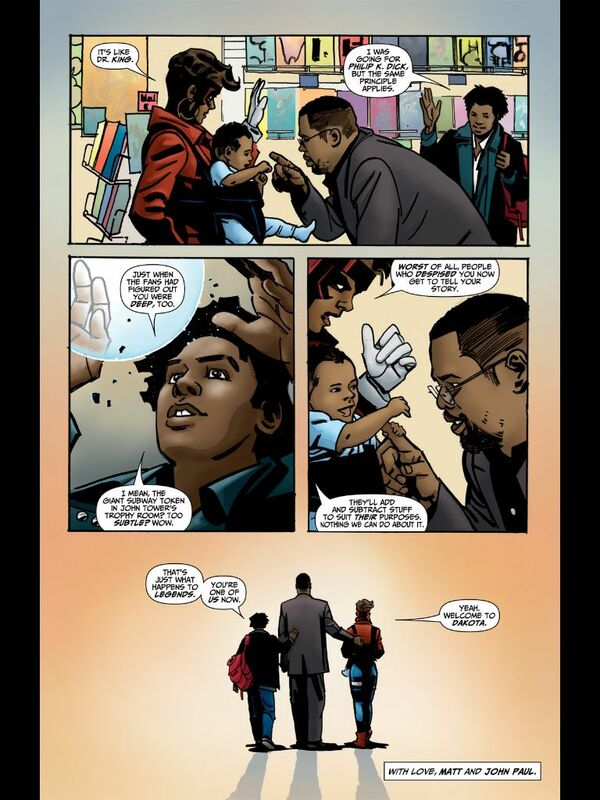 Adafruit’s comic reading list: Static by Dwayne McDuffie #adafruitcomics « Adafruit Industries – Makers, hackers, artists, designers and engineers! A new edition of Adafruit’s comic reading list — this week it’s Satic by Dwayne McDuffie, recommended by your humble neighborhood shipper Zay! When I was a kid there weren’t very many superheroes in comic books who looked like me or like the people I lived with or the kids I hung out with. The superhero thing wasn’t just aspirational, it was an impossible distance away, an ideal land where everyone was built perfectly and had white skin and straight hair. Then along came Milestone Comics. Dwayne McDuffie reached a deal for DC to publish four superhero comics titles under the Milestone Comics label — all featuring African-American superheroes, casts, and supporting characters. It was unprecedented. His heroes were a response to what was happening in black America at the time, raw and unfiltered, all about the world he lived in. Look at those tag lines. An anti-corporate tech warrior: “A cog in the corporate machine is about to strip some gears.” A riff on Superman told from a young black girl’s perspective: “She’s got your hero right here.” A super-powered street gang: “America eats its young.” America eats its young? On the cover of a comic book — generally considered a kids medium? With no mature reader label? The comics world could barely handle it back then, and frankly it would be shocking today. But that was only a part of it. Virgil lived in a neighborhood that I could recognize, and had problems that made sense to me. His father wasn’t a perfect and honorable man who died a tragic but inspiring death — Virgil’s dad was a bad role model, an absentee father who inspired nothing except self-doubt. I’d never seen a superhero like that before. 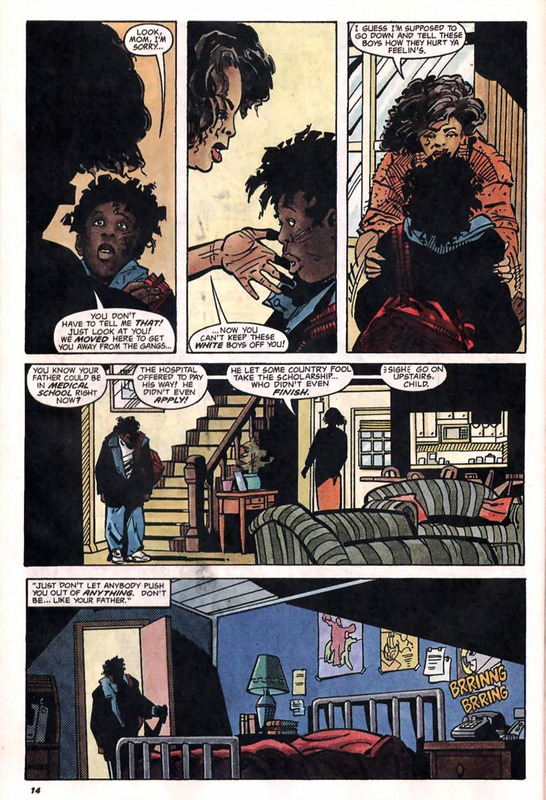 Static and the other comics in Milestone also had a profound social conscience. Addressing social issues was part of their basic DNA. Virgil rescues a friend from gay-bashing, super-powered gang-member protect neighborhoods, and corporations are framed as bad guys. Milestone in general was ahead of its time in dealing with corporate consciousness and the notion that if they existed in our world, superheroes would need to carve out space in which to retain their identity. Punching bag guys in the face isn’t enough. Dwayne McDuffie’s comics suggested that a black superhero would need to fight against the cultural current in order to be seen as a hero. Static faced that struggle and more. Dwayne McDuffie passed away, suddenly, in 2011 at the age of 49. The comics world mourned him, and those of us who found solace and hope in his vision of what a black superhero could be thanked him for his work. 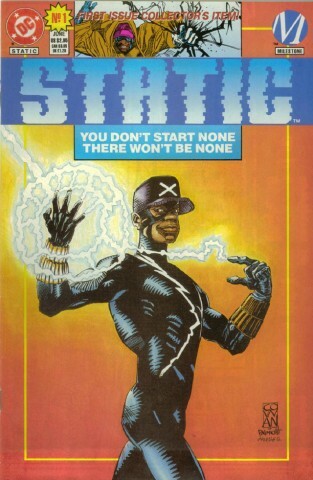 Static will always be one of my favorite superheroes. Check out our previous posts Bee and the Puppycat, Spacetrawler, Grrl Power, Krazy Kat, She-Hulk, King City, The Whiteboard, Hubris, Akira, The Wicked and the Divine, Saga, Are You My Mother?, and Cairo!